Blackjack Mine, Santa Catalina Island is a formerly active lead (Pb); zinc (Zn); silver (Ag); and copper (Cu) mine located in sec. 24, T9S, R15W, SBM, on the northeast slope of Black Jack Mountain, 14 miles NW of Avalon. Established in 1923 by David Malcolm Renton, it was the principal mine on the island, where a vein, 4 to 25 feet wide, dips 60° NE. 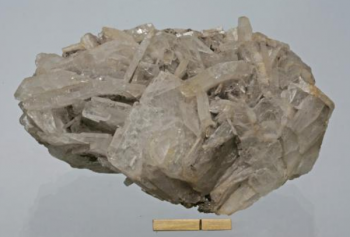 In a large vein of hornblendite and schist, galena, sphalerite, pyrite, and traces of chalcopyrite and arsenopyrite occur, with quartz, barite, calcite, and a little fluorite. The mine workings include a three-compartment vertical shaft 535 feet deep with levels at 400 and 500 feet and an adit on the vein. From the adit was sunk a winze with levels at 100, 200, 300, and 400 feet. Underground workings total about 5,000 feet, the longest drift being 390 feet on the 500-foot level. 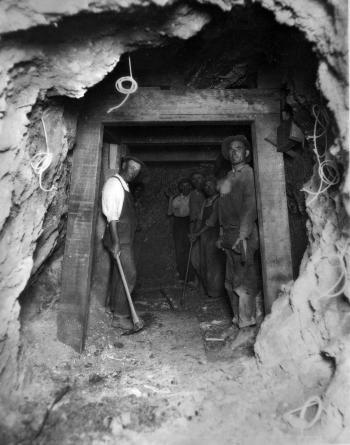 The first ore shipment was sent to smelters with about twenty tons of raw ore containing silver, lead and zinc. Best values were recovered from an ore shoot 6 to 12 feet wide developed from the 400-foot level to the surface; this ore shoot was 25 feet wide at the 500-foot level. Blackjack Mine reached its height of operations from 1919-1929. The minerals were extracted from the mine and carried by ore cart along a precipitous skyway down to the processing facility at White’s Landing where the finished material was then taken by barge to the mainland. Almost all of the lead-silver-zinc ore that has been produced in Los Angeles County has come from deposits on Santa Catalina Island. Gieser, H.S. (1927), Mining and milling on Santa Catalina Island: Engineering & Mining Journal: 124: 245-247; […(abstract): Geol. Zentralbl. : 36: 215-216]: 245. Bailey, Edgar H. (1941a), Mineralogy, petrology and geology of Santa Catalina Island, California: Unpublished Ph.D. dissertation, Stanford University: 78. This page was last edited on 13 July 2018, at 07:35.